Paris has its boulevards; New York has its avenues; San Francisco has its streets. For a century and a half, the Streets of San Francisco have been celebrated in literature, song, and myth. They have also inspired a spate of films and television series where intrigue is played out on the hills and every other car chase ends with an explosion or abrupt plunge into the Bay. But who were the men – and, on occasion, women – whose names are perpetuated in asphalt and concrete? 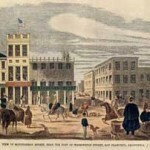 The identity of these individuals, from explorers and pioneers to politicians and hookers, was the subject of the exhibition The Streets of San Francisco. 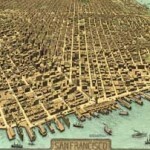 The Streets of San Francisco incorporated maps, photographs, prints, and artifacts that recalled San Francisco’s transformation from mission outpost to instant metropolis. Under the alcalde Francisco Guerrero, Jean-Jacques Vioget laid out the eastern side of the town, which now constitutes the financial district, in a grid-like pattern that he borrowed from plan of New York. 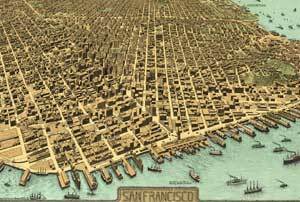 It was Jasper O’Farrell who extended this plan up to Western (now Van Ness) Avenue, superimposing a grid on to the entire eastern half of the San Francisco peninsula bisected by the diagonal that is Market Street. O’Farrell’s plan ignored the physical contours of the landscape and wherever needed the landscape was remade in order to conform to the plan. The names of certain Spanish-named landmarks — Alcatraz, the Embarcadero, and “Los Pechos,” translated as “Twin Peaks” — were also retained. “The first consideration in selecting a street name,” stated a 1909 City commission report, “should be use. It should not be difficult to pronounce or spell, nor should it be very long.” The report goes on to say that “the names of persons are the best street names, especially those of historic or patriotic significance,” singling out “local pioneers” as particularly worthy of commemoration. 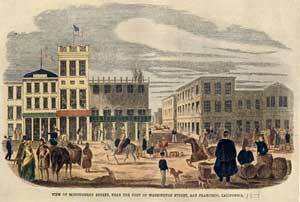 The report may have had in mind pioneers like Brannan, Frémont, Larkin, O’Farrell, Sloat, Stockton, Sutter, and Vallejo, who were all honored with major thoroughfares. Many Spanish explorers like Alemany, Anza, Arguello, Balboa, Cabrillo, Castro, Guerrero, Ortega, Portola, Serra, Ulloa, and Valencia, were similarly commemorated in the southern and western districts of the city. There were presidents, business leaders, and literary figures, but a scant number of streets named after trees, perhaps due to the relative absence of maples, sycamores, and elms within the city limits. There were neighborhoods laid out with streets honoring other American states and California cities, and a rather confusing network of numbered streets and avenues in separate parts of town. Women were accorded few streets names, but surprisingly rather a lot of alleys. The exhibition also incorporated a number of buildings, monuments, and public spaces bearing such names as Crocker, Fair, Flood, Hopkins, Huntington, Russ, Spreckels, and Stanford, all of whom made significant contributions to the history and the life of the city.